Unique and ethereal Tallit made of Sheer organza silk. Finely embroidered silk panels embellishes the tallit. Pale ivory white stitching bands on a background and light gold panels with four cornered on gold as bordered layer. 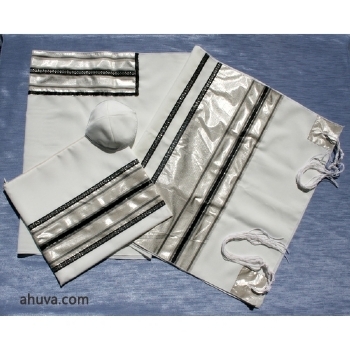 Hand painted 3 piece set with silk bag and kippah included. Suitable for men and your choice of base material below.